The Washington West Film Festival is Underway! It’s our fourth year supporting the Washington West Film Festival and we’ve continued to love it since the day we started. This year we geared up for a fresh set of partners, sponsors, films, and events with some new website features. 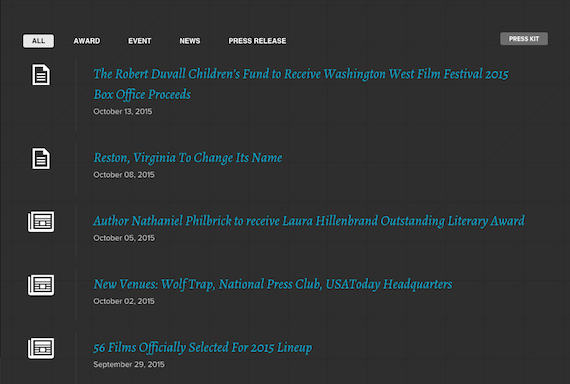 You can learn more about Washington West’s current project partner (The Robert Duvall Children’s Fund), as well as Past Projects in the new Giving Back section of the site. Each year, 100% of box office proceeds are donated to the partner organization. Couldn’t catch the festival but want to see and read about all the fun? 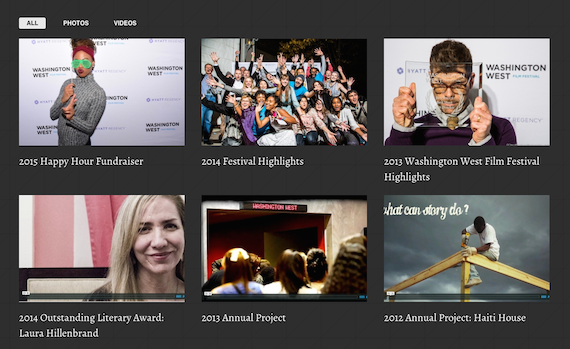 Visit the new Gallery or filter through news, awards, event, and press in the updated News section. And, if you’d like to support this year or next year’s Washington West Film Festival, we’ve added more options for offering your support, both through donating time or money. We agree that “Story can change the world,” and love supporting a festival built around this core belief. We're excited to see Washington West help change the world with it's spotlight on so many inspiring films and support for such an important cause. You can still grab tickets for several showings across the DC Metro Area at wwfilmfest.com/schedule.